Welcome to the wonderful world of Virtual Private Network technology. Anti-virus suites protect you from viruses while firewalls protect the stuff on your hard drive. So who protects data that your computer transmits over the Internet to computers, applications, servers and websites? A VPN does that! If you are connected to the Internet right now, you are connected courtesy of an Internet Service Provider. This means that you are under the strict rules and regulations of the ISP, as well as your local government. What does this mean? It means you have zero online privacy! The government can talk to your ISP and find out exactly what you’ve been doing on the Internet any time it wants! It is for this reason that we believe it might be a good idea for you to consider investing in the services of proXPN. 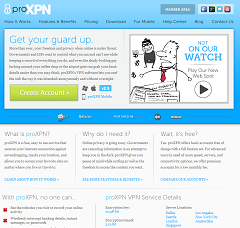 ProXPN is a high-ranking VPN service provider that operates out of the Netherlands and is backed by the testimonials of notable entities like cNet, Lifehacker and even PC Magazine. Furthermore, the company came together in 2009, and these days it carries up to 50 employees. Its VPN services encrypt any and all data that is transmitted to and from your connected devices. This means that nobody (not even the NSA) can tap into and monitor your online activities. Its services also hide you behind a global network of servers, thus making it absolutely impossible for anybody to trace down your exact location. Instead they will encounter the location of the servers. Its VPN plans can be accessed from a variety of devices, including Windows and Macintosh desktops, as well as iOS and Android devices. Now that we got that out of the way, let’s take a look at the provider’s exact services and plans. proXPN is the one and only VPN provider in the world to offer a completely free VPN option that is 100% and not restricted by any time limits. 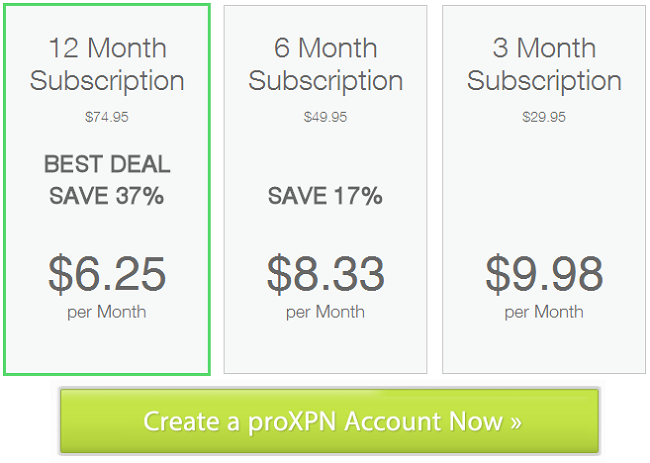 You can use the free version of proXPN for your entire life, if you so desire. While this is awfully impressive, especially considering that these features are offered for free, there are a few things to keep in mind. With the free VPN service, you are limited to a single US-based. Furthermore, your bandwidth is reduced to just 300kbps, and you cannot take advantage of it from mobile devices. One great advantage to the free service, however, is that it isn’t riddled with any annoying ads. The experience is just as smooth as the Premium VPN mentioned below. You can use PPTP instead of OpenVPN. Unfortunately, though, you still cannot take advantage of UDP protocols like L2TP. You get access to seven servers: 4 in the United States, 1 in the Netherlands, 1 in Singapore and 1 in the United Kingdom. You get unlimited bandwidth and speed, meaning the only limiting factor is the speed of your own Internet connection. You get unlimited port access, meaning you can use the VPN service to use non-browser Web tools like IM clients, email clients, etc. You can use mobile devices like the iPhone and HTC One and more. Note that you will have to install a free app before you can do this. You get access to VPN Guard, a special tool that allows you to force certain programs immediately shut down in case you suddenly lose your VPN connection. You are allowed to use the VPN service to engage in P2P file sharing through networks like BitTorrent. It is obviously better in numerous ways. And it includes an impressive list of features given its budget-friendly price. Both proXPN services operate on computers through the proXPN client. The website automatically detects your operating system during the download and ensures that you get the correct version. All you have to do to get started is in fact just download the client. Once you install it and run it, you’ll encounter a login screen with a ‘CREATE AN ACCOUNT’ button. If you click that button, you’ll be able to create a free account or sign up immediately for the Premium VPN service. We recommend you start with the free account to get an idea of how the website works. Once you set up an account and log in, proXPN will display in your system tray. Once it turns green, then you will know that you have connected. Furthermore, it will display your new IP address, as well as the location of the server. And that’s it! It’s as simple as that to use the desktop client. You can now browse the Internet, engage in instant messaging, have some Skype conversations and more without having to worry about somebody monitoring you. Please do take the time to test it out with the free service. We are pretty positive that you’ll like it as much as we did! The customer care at proXPN is extraordinarily good. You can contact support agents through the phone, through email and through Twitter. The last one really impressed us. It’s not as personal as live chat, but it’s not a bad substitute. The website also hosts a comprehensive Help Center chockablock with useful information. What payments options are available for Premium VPN service? At the current moment, proXPN accepts traditional credit cards, as well as Google Wallet, Amazon Payments and PayPal. Unfortunately, it does not support the BitCoin currency. This means that you cannot pay anonymously. The good news is that your payment information is only kept on file for fourteen days. If you pay for a year’s worth of service, you will be in the clear for the rest of the year after 14 days. If you pay monthly, however, you’ll have to go through that 14-day period every 30 days. This is why we recommend choosing a longer-term package. Both the free and Premium services utilize a 2,048-bit key and a 512-bit tunnel that provide an extraordinary level of security and protection. Our tests reveal that nobody can track down your location or hack your computer while you are logged into any of proXPN’s VPN servers. Can the services be used on multiple machines and devices? It is okay to use your VPN account on a computer, then use it on your phone and then use it on another computer. What you cannot do is use it on multiple devices simultaneously. If you try to do this, then the other connection will immediately be dropped. Does proXPN also protect stuff like instant messengers and Skype? Unfortunately, only the Premium VPN service offers this. The good news is that it comes automatically. As soon as you log in to the VPN client with your Premium account, you’ll have full security for all Internet applications on your computer or device. Does this service work with routers? You can without a doubt use the VPN if you utilize a router. Just make sure that the router has port 1723 open and that it allows for the GRE 47 protocol. Is the paid service worth it? We feel that the paid service is definitely worth it. It offers faster speeds and more servers. Furthermore, it provides a lot more protection. Remember that the free service only protects your Web browsing. Plus, the free service does not offer mobile-device protection. Premium VPN can be obtained for $6.25 a month if you sign up for a year’s worth of service. Otherwise, it costs $8.30 a month if you sign up for six months of service or $9.95 if you sign up for just one month of service. Be advised that all three options come with a 7-day free trial during which you can test out the service. If you dislike it and cancel before the 7 days runs out, then you are not charged. We feel very impressed with proXPN and its awesome services. We spent about two weeks testing the free service until we upgraded. We do not regret upgrading. The enhancement in speed and services was incredible. It’s one thing to feel protected on your desktop. It’s another altogether to feel protected on your mobile phone! Overall, proXPN excels over its competitors in numerous ways. It offers great prices, terrific servers and awesome services. And like we mentioned at the beginning, it’s backed up by a plethora of big time names in the tech industry. 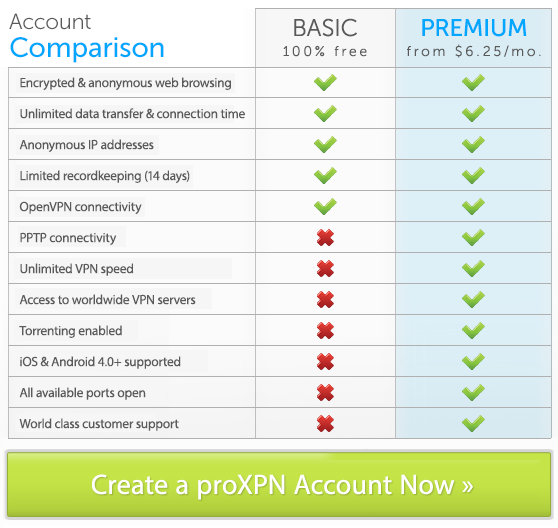 With that said, if you are serious about protecting yourself on the Net, we highly recommend you choose proXPN!